We know what Battleworld is, but HOW did it come to be!? This issue—ANSWERS!!! Also, a rivalry rekindled, revelations abound, and two shocking casualties of the Secret Wars!!! Marvel’s latest earth-shattering, universe-shaking event reaches its midpoint with Secret Wars #4. Since debuting back in May, Secret Wars has obliterated the Marvel Universe as we knew it and introduced in its place a hodge-podge Battleworld composed of various regions based on alternate realities and stories from the entire back catalogue. 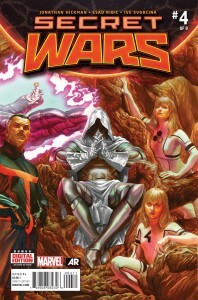 In many ways, Secret Wars has reinvigorated the Marvel line, stimulating and initiating a plethora of intriguing, well-crafted spin-off mini-series helmed by some of the best creative teams in the industry today. While these series may be high-quality and extremely entertaining, many readers have cursed Marvel and Jonathan Hickman’s apparent eagerness to do away with over 70 years of history for the sake of the story. As Secret Wars reaches issue #4, however, it has become evident that Hickman and company have a much different plan in mind and, particularly in this issue, intend on honoring much of that history. A prominent rivalry (perhaps the prominent rivalry outside of Spider-Man’s rogues) is rekindled in Secret Wars #4, as the “survivors” of the Final Incursion from the Earth-616 Universe come face-to-face with Doom, the All-Father. This climactic confrontation is equal parts shock-after-shock-after-shock as well as extraordinarily cathartic. Before we get to that moment, however, Stephen Strange explains to the survivors how Battleworld came to be. In an incredibly not-typical-for-Hickman fashion, the explanation is quite straightforward and speaks to the writer’s handle of characters like Strange, Doom, and Reed Richards. It makes sense, it’s clearly presented, and it sets up the confrontation at the tail-end of the book. Esad Ribic and Ive Svorcina are absolutely killing it on this series. The epic, heightened realism and pseudo-painted aesthetic is perfect for the weight and drama of Hickman’s world-building, and the aforementioned climax of this issue is expertly staged. I will say that the facial expressions do sometimes border on the unintentionally hilarious, as evidenced by the opening full-page spread of Thanos battling Thors; it’s remarkably crafted in all of its fervor and violence and aggression, but Thanos’ face is one of bewildered shock, as though he just farted. Hilarious. Buy. I’m really digging Secret Wars. Aside from the obvious scope and impact on the Marvel Universe proper, Jonathan Hickman’s trademark complexity has actually translated to an easy-to-follow, character-driven story. It’s a Doom story, and naturally a lot of things sort of fall into place with that sort of story. Check it!